Eventually the pressure at the Virgin studio got too much and I was given a get-out in the form of an offer of a job in Paris, again doing studio maintenance. Barbara Craggs, to her credit, tried to talk me into staying but probably got more than she bargained for when she heard what I thought of Virgin by this time. My stay in Paris was fairly uneventful, and I have fond memories of the ice cream desserts we would often have at the Palais de Congrès when we would retire there as a group after work. The studio was in the very centre of Paris but turned out to be a sleepy backwater affair, with its main function apparently being to try and keep the studio owner out of mischief. He was one of those interesting psychological cases which result when people are once the darling of the masses and then become “has beens,” never quite coming to terms with their fall from fame. His wife had been more fortunate and spent most of her time in America having affairs. The studio was empty most of the time and the resident engineer and I would sometimes go on jaunts out and about. One morning we visited a Philips studio – I think it was equipped from top to bottom with Philips equipment – and joined a session on which the engineer had been working all night. Not speaking much French, I was able to drift around the control room examining the equipment while my companion chatted with the staff. The sound emanating from the monitors was like glasspaper, massively top heavy as a result of the engineer’s fatigue. 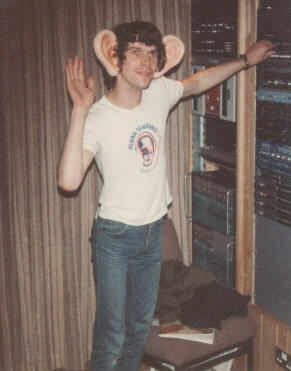 The gent who had shown us in, the studio manager or chief engineer, was quite embarrassed about it. Another time we went off in our engineer’s 2CV ostensibly to visit an electronics manufacturer of some kind but really to call at a café in a remote suburb of Paris which kept a puma as a pet. It was restrained by a heavy chain and laid, looking bored, on a window-sill. So we sat and had coffee, looking at it while it looked back at us. We were advised not to try and stroke it. With this sorry state of affairs (alright if all you’re interested in is skiving, but not exactly what I was there for) I made an attempt to get the studio back onto a proper footing, and the studio owner agreed to the plan. Something obviously needed to be done, since for one thing the owner had never recovered from an incident, before my time, when a band of Negroes had spent several weeks in the studio then gone away with a cassette tape to listen to at home, as everyone does. (Not many people have a multitrack or master recorder at home.) However they had gone on to cut their album directly from the cassette and, not needing access to the master tapes any more, neglected to pay the bill. I can’t remember if there was no cassette recorder in the control room at all, or whether the only one allowed was such junk that it was acutely embarrassing to everyone. Giving a client a cassette tape at the end of their session had become a major problem. Although I didn’t appreciate it as such at the time, the climax of my stay in Paris was a party at Maxim’s restaurant. A band called La Dolce Vita had been in the studio and had somehow managed to get themselves booked as the entertainment for the event, and I was asked to do the sound. I turned up in a taxi, prepared for any eventuality with my toolbox, where a notice on the door announced that the restaurant was closed for a private party. It was held in the back of the restaurant. At the beginning there was talk going round that some princess or other might attend and it turned out to be Princess Grace of Monaco. We did the set, with the notables seated at small tables, the band on the small stage, and I on a raised platform at the rear where the mixing desk rested on a ledge that might have been purpose made for it. Afterwards I joined the band on the floor and Andy Warhol came over to tell us that he liked the band and had enjoyed the set. We had gathered in a rough semi-circle and were all smiles, and I remember him being very, very white. As I was pottering around later, Alan Whicker jumped onto the stage and grabbed a microphone so, thinking that he wanted to make some kind of announcement, I quickly resumed my place behind the desk and brought up the relevant fader. It turned out that Whicker, being somewhat inebriated, had been overcome with the urge to croon and after a few lines I faded him out again as tactfully as I could manage. That job came to an end when, on top of the studio owner’s duplicity, my mother, in an advanced state of paranoid psychosis, set fire to the family home in Hull, having by this time burnt thousands of pounds’ worth of antiques thinking they were possessed. She had taken the four half-Chinese children to the other side of the road to watch the house go up. I returned to England to repair the damage and redecorate it. It had only supposed to have been for a few months but it dragged on, as my rate of work slowed to the more sedate northern pace. When you direct your own work, half the job is forcing yourself on. A lot of people decide what to do, then when it comes to its actual execution, they cast around finding excuses to avoid expending the effort. The result is that they just go round in circles, achieving nothing. The pace of life in London is much quicker, though I’ve never been impressed with the obsession with status so prevalent there. At a party in London, talking to someone, within five minutes (sometimes even less) the following will be evident: 1. What your job is 2. What you earn and 3. Which part of London you live in. In the north, by contrast, you could fall into conversation with someone and spend half the night discussing some arcane topic without any of these even being alluded to.